If you’re looking for an E-commerce platform and willing to hire a developer, or if you’re technically proficient yourself, you may be considering an open source E-commerce platform like Magento or Zen Cart to host your store on. Free, open source solutions may take a bit more work to get things up and running, but they often offer much more flexibility in terms of what you can do with your store. 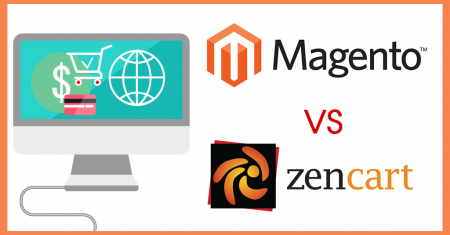 Magento and Zen Cart are very different beasts, however, and which one you choose depends heavily on your own needs and capabilities. Zen Cart branched off of osCommerce in 2003. It’s PHP/MySQL based and one of the oldest e-commerce platforms available. It has many of the essential core features you need for e-commerce, and is easier to customize. Zen Cart’s long history means there’s a lot of support available online, and the code base itself is written to be fairly friendly to simple changes and non-developers. There’s a built-in override protection program to protect PHP code changes, so you don’t lose your customization upon upgrading. Zen Cart has many of the options you’ll need to manage your store through out of the box features or free plugins, as well a developers toolkit to help you locate settings to be customized. Zen Cart is a long-lived e-commerce solution that offers a lot of functionality for free, but it’s also become a bit of a dated solution. The graphics aren’t the most appealing for 2016, and there’s limited SEO and product reporting functionality. Magento was initially released in 2008 and rapidly became one of the most popular e-commerce platforms. It was the most popular platform used among the Alexa top 1 million sites in 2016. It should be noted that Magento offers both a free open source option (Magento Community) and a paid subscription option (Magento Enterprise), which may contribute to its large market share among top websites. Magento Community lacks some of the features available in Magento Enterprise, but still offers a robust list of features. Magento offers many of the same functionalities that Zen Cart does, as well as one page checkout and multi-store management. Magento’s popularity means there’s a strong developer community contributing to Magento and creating/updating plugins to extend functionality. This functionality comes at a cost, however. Magento is a beast of a platform with great scalability and is highly suited to handle store growth, but it can be resource heavy and requires more technical expertise to manage fully. In general, Zen Cart can be a friendlier option to people who want a simple and free platform to set up and customize themselves, but users who are interested in long term growth and flexibility for their future are better suited to set up on Magento. Zen Cart still looks dated, lacks SEO capability, and can lag when it grows to over 1,000 products. Magento is more popular and has greater functionality, especially in terms of out of the box SEO options, making it a better platform to can build your long term e-commerce business with. If you still can’t decide or if you need any assistance building a powerful site for you to build your sales on, let us know by contacting us or calling us at 626.400.4511.